Pronghorn antelopes are nomadic, covering a territory of up to 40 square miles. Found only in North America, they frequent open grassy areas and forest parks. Pronghorns forage for grass, weeds, shrubs, wild herbs, domestic crops and cacti. Bucks and does eat, sleep and roam together in large herds until mating season arrives. Mating season for pronghorn antelopes lasts from September through October. Early cold weather means an early rut. Bucks separate from the other males in August, and begin hanging around the does. Male pronghorns grunt and snort, pushing and fighting other bucks to gain the females' attention. Rubbing their antlers on trees and bushes, they mark the area with their scent. They are less wary of danger during the breeding season, focusing on the does. In September individual dominant bucks gather three or four does each, forming harems. Younger bucks stay nearby, hoping to separate a wandering doe from the harem. Female pronghorn antelopes choose which buck they will mate with. Individual does visit several males, staying with each harem for several days before choosing a mate. The gestation length for pronghorn antelopes is about 250 days. Twins account for more than half of all births. Male pronghorn antelopes weigh up to 130 pounds. Females are slightly smaller, weighing up to 105 pounds. Their large eyes are set on the sides of their heads. Antelopes' long legs, large lungs and light bone structure enable them to run up to 40 mph for long distances, with short bursts of up to 60 mph. Bucks run with their heads up, making it easier to distinguish them from does, who run with their heads down. 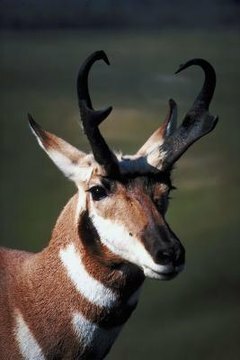 The pronghorn antelope's horns, or antlers, have the qualities of both horns and antlers, but are neither. The core is bone, covered with a horn sheath made of fused hairs. After the breeding season is over, the sheath is shed from the antelope's horns. Bucks' horns can grow up to 20 inches in length. Does' horns are significantly smaller, reaching only 4 inches. Young bucks' horns appear when they are 3 years old.